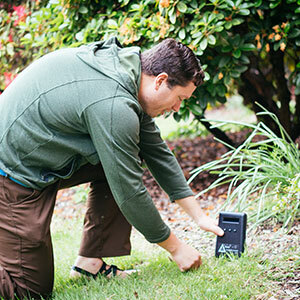 College of Public Health and Human Sciences student Barrett Welch sets up an air sampling monitor in Philomath. In comparison to bigger cities like Portland, or even Corvallis, Philomath supports a relatively small population and is set in a rural, forested location. But the frequent bustling of logging trucks and daily activity at local sawmills has some residents concerned about air quality. “The community has a lot of young children, and people want to be aware of what’s going on in their surroundings,” says Jeff Schiminsky, a Philomath resident and founder of Natural Opus, a non-profit organization that tracks and monitors pollution. Philomath resident Jeff Schiminsky discusses air quality concerns with CPHHS Assistant Professor Laurel Kincl’s class. Since the closest Department of Environmental Quality (DEQ) air sampling monitor in Corvallis is too far to collect data from Philomath, Jeff took citizens concerns to the DEQ, asking for an air monitoring test in their town. He was told they did not have the resources to do so. Instead of giving up, he took that ‘no’ and turned it into a ‘yes’ – and a new partnership with Oregon State University’s College of Public Health and Human Sciences (CPHHS). Jeff and CPHHS Assistant Professor Laurel Kincl know each other through the Corvallis Sustainability Coalition, where Jeff serves on Laurel’s stakeholder advisory board for the Community Outreach and Engagement Core of OSU’s Environmental Health Sciences Center (EHSC). Laurel was aware of Jeff’s interest in understanding the air quality in Philomath, so she approached him about the possibility of a collaboration. Knowing she would be teaching a graduate-level exposure science course this spring, Laurel thought it would be a great opportunity for her students to get practical, hands-on experience working directly with community members to address their public health concerns. Students test out air sampling monitors on campus. 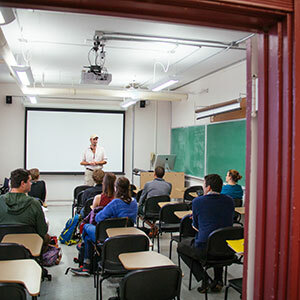 She enlisted the help of CPHHS Assistant Professor Perry Hystad, who is an expert on air quality, and together the two created a project for Laurel’s students using new air sampling monitors Perry purchased for his research. With the new monitors in hand, five groups of two public health students set out to find answers. They placed the monitors, which use a fan to draw air across a laser detector to count the number of particles in the air based on their size, around Philomath including at residents’ homes and near schools, sawmills and major roadways. Monitors were set up at the residents’ homes to sample continuously for four days, and students used other monitors to sample air at different locations throughout town and along Highway 20 for 10 minutes at a time. 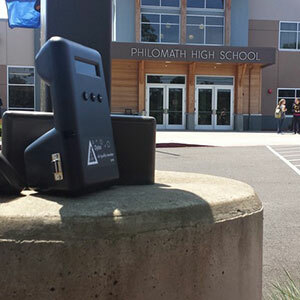 The class set up air sampling monitors around Philomath to measure air quality. After analyzing the results as a group, with the help of Laurel and Perry, the data showed excellent to fair air quality, with some periods of poor air quality. “It wasn’t anything alarming,” says Laurel, who serves as director of the Community Outreach and Engagement Core of the EHSC at Oregon State. Laurel points out that the tests were conducted during a limited time period – and many environmental factors can affect the quality of air, such as the time of year, cigarette smoke, trucks or trains going by and wood burning stoves. CPHHS Assistant Professors Perry Hystad and Laurel Kincl work with students to determine the best method of reporting air quality. As part of the project, students worked with the EHSC to prepare data reports to distribute to interested community members. 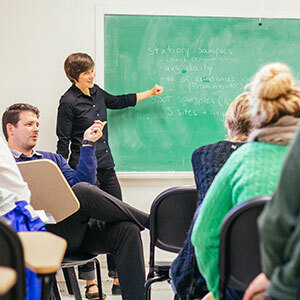 Laurel says not only does partnering with a local community benefit concerned citizens, it also provides students with valuable tools they’ll use in their future careers in public health. “The real world application of getting out there and being able to physically do something rather than just researching how these methods are done and reviewing research papers was very beneficial to us all,” says PhD student Amber Lyon-Colbert. Laurel says she will continue the air monitoring section of the course in the future if more communities are interested in seeing their results. In the meantime, Perry, in collaboration with Global Oregon and the University of Oregon, will conduct a similar exercise in Gabon, West Africa. Read more in the Philomath Express.